BEAM central vacuum systems effectively carry 100% of dirt, dust and allergens away from your living environment into a unit located in the garage or basement. Having a flexible, portable hose makes it easy to transport your vacuum from room to room easily with having to carry around a heavy vacuum. The BEAM central vacuum system is more powerful and quieter than leading portable vacuum brands. The BEAM system is practically maintenance free, with no cleaning ever required. The filters have a self-cleaning design and are permanent. If your hose is damaged or your vacuum is not working properly, we can repair or replace your system. Tacoma/gig harbor area homeowners, we can help you with any of your vacuum repair needs. 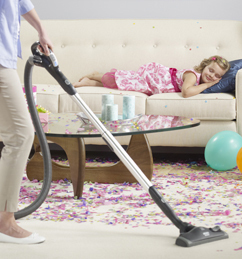 Central vacuum installation can be done on any home from brand new to decades old. With installation complete in just a few hours, you will be able to begin using your new vacuum system quickly.